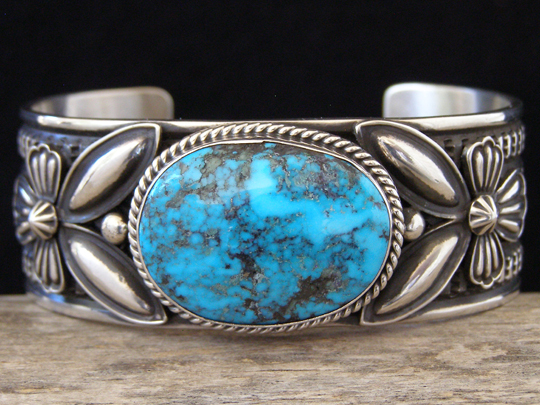 Andy Cadman Ithaca Peak Turquoise Bracelet size 7"
This uniform-width cuff is set with a rich blue oval of natural, untreated Ithaca Peak turquoise from Arizona. The Ithaca Peak Mine, like the Kingman Mine, is owned and mined by the Colbaugh Family. It is near the Kingman Mine, but is considered distinct from the Kingman Mine. Ithaca Peak turquoise is a bit richer blue than Kingman turquoise and the very best Ithaca Peak turquoise is deep blue and costs considerably more than regular Kingman turquoise. This cuff shows off Andy's excellent stampwork and well-executed craftsmanship. Stylized birds formed by a combination of appliqueés frame this premium, natural stone. Hallmarked A. CADMAN and stamped Sterling inside the cuff. Stone: 1 3/16" x 7/8"
Terminal to terminal: 5 3/4" Gap: 1 1/4"